This 14K yellow gold mens wedding band features a smooth polished central band engraved with a repeating pattern of diagonals and organics. The central band is flanked by twisting ropes of gold and bright, polished edges. 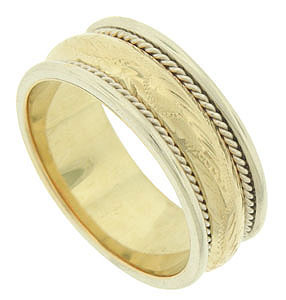 The antique style wedding ring measures 8.07 mm in width. Size 9. We cannot re-size, but we can reorder in other sizes. Also available in 18K, white gold, platinum, palladium or any combination of metals. Contact us for current market cost.